Blastrac Iberia celebrated its 20 years anniversary! Blastrac Iberia began 20 years ago, then due to expansion it relocated 3 years ago to their new facility in Arganda del Rey, near Madrid. Over the last 20 years, Blastrac Iberia has evolved and grown in size and is now more developed and equipped to satisfy its customers both in Spain and Portugal. Around 100 customers from Spain, Portugal, Argentina, Perou and more took part in this celebration. During these 2 days, they could discover our latest products & innovations. It was a really successful event, thanks to the large number of visitors and perfect organization. 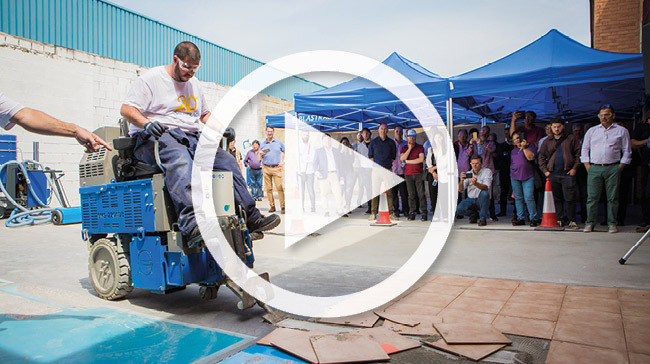 Demonstrations were carried out throughout the day highlighting our different techniques & solutions for floor preparation: shot blasting, single disc grinding, triple disc grinding, scarifying, stripping, steel blasting and dust collection systems. It was also the perfect opportunity to introduce our new machines such as the BMG-2200 ride-on triple headed grinder, the biggest grinder on the market, and the new Blastrac dust collectors BDC-1133, BDC-122 & BDC-133. As usual, our team of experts were present to answer any questions & provide any necessary advice. We would like to thank every visitor who attended this anniversary. Below you can find some pictures & a video of the Open Day.